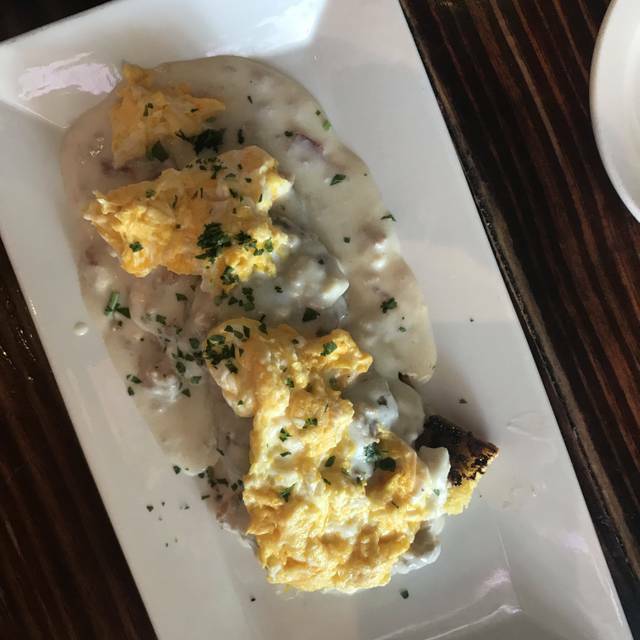 *Brunch served Saturday – Sunday, 10AM – 3PM. Love the food at MAX’s Wine Dive and planning a special event? Why not have the best of both? MAX’s Wine Dive can cater all kinds of private and corporate events. Let our experienced staff do the work and create the perfect birthday, reunion, rehearsal dinner, graduation, wedding reception, corporate outing, happy hour, charity event…the list goes on and on! For more information, email us, infoHOU2@maxswinedive.com. Love the food at MAX’s Wine Dive restaurant and wine bar and planning a special event? Why not have the best of both? We can cater all kinds of private and corporate events. Let our experienced staff do the work and create the perfect event! At MAX’s Wine Dive it’s all about the EXPERIENCE. We’re passionate about food and wine - just like you! We pride ourselves on bringing you gourmet comfort food made from the highest-quality local ingredients in an exciting and unique atmosphere. Amazing food and live music! Had a wonderful brunch with friends from out of town. We all enjoyed our meals and drinks. Felt like the pricing could have been a little lower but overall we had a great experience. We reserved a table online, super great. Awesome waiter, and zero complaints on the atmosphere! I like to try new places, but if I cannot get in somewhere new next time I will defiantly make this a safe back up! I have been to this location multiple times. 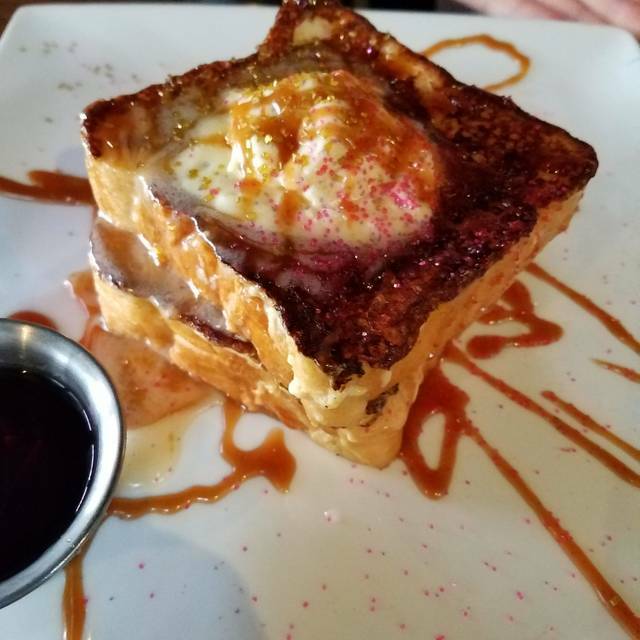 My daughter was in town and chose this stop for brunch. After the waiter dropped off our drinks and food we were never checked on until I asked for the check. I choose a 11 am reservation in hopes of this location not being to busy to serve us. On the day we visited, I noticed a lack of servers. We tried the pineapple mimosas but wanted to try another before we left but was never ask. Happy hour is great! We got seated promptly and waiter was on top of everything! We enjoyed our food and cocktail. The chicken is delicious. Was a bit disappointed that they done have pancakes (red velvet especially) anymore. My wife and I decided to dine here since we decided to head to Downtown Houston for our 2nd Wedding Anniversary. Christopher is absolutely amazing. You can tell when people love people and love what they do. He recommended the fried lobster tail with chicken. LISTEN....it was amazing, especially paired with Prosecco. Christopher just made a long time customer just by being himself and loving what he does. This is the best brunch place by far and who makes this experience so much more amazing is Chris. He is awesome!!! It was absolutely perfect! The food, wine, and service were incredible. Came to celebrate a birthday. Got seated and had to ask for service. Server wasn’t very attentive at all. Food was great though. 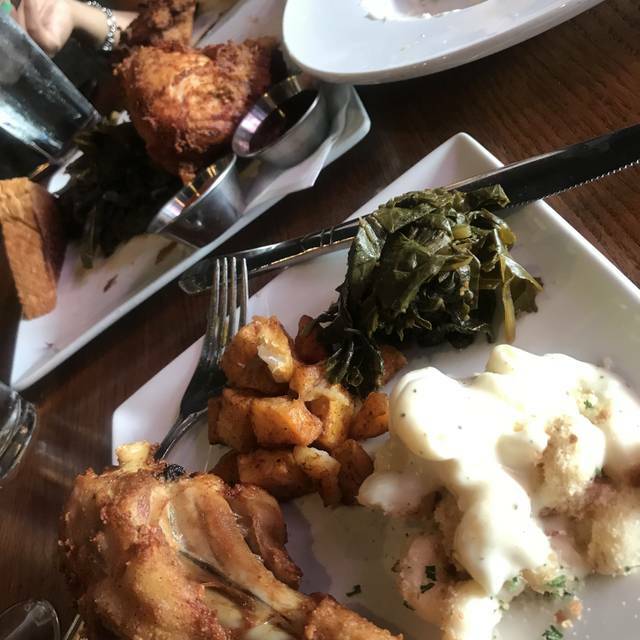 We enjoyed delicious food and excellent service; I highly recommend the fried chicken and greens! Excellent all around. Great experience! Family, food and live music!!! We will do it again. This was my boyfriend and I first time eating here. We Loved the food. I loved the deviled eggs, which were salmon and crab. 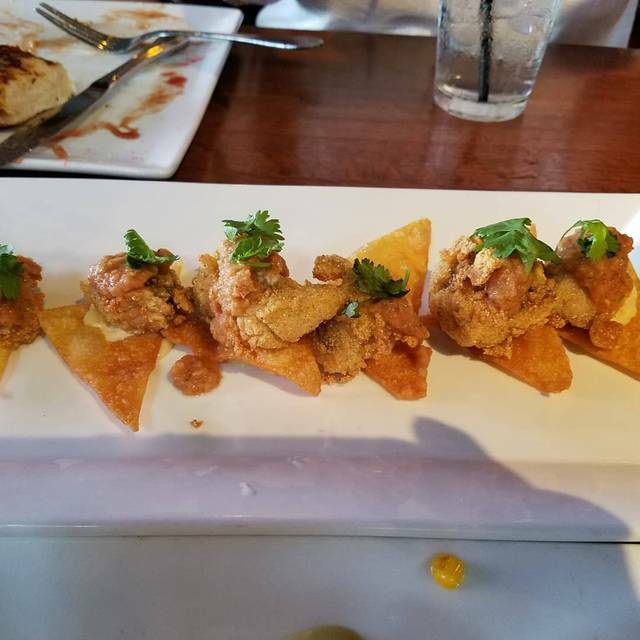 Never had deviled eggs that are fried. Our entree was also delicious. I will definitely be coming back. The food smelled amazing. The Han and cheese omelette was delicious. The waffles and chicken were huge. The service was great. It was decent. I’d heard so many great things about this place, but actually experiencing it was just okay. It was like eating at any other place. Food wasn’t seasoned enough for me. I was able to get a reservation for me and my family for Valentine’s Day. We were seated right away and the food was excellent. The waiter was nice as well. Despite being down one server on a busy Friday night, our server was very attentive and courteous. The food was delicious and the drinks were well made - definitely coming back! This is the best fried chicken around . The batter is seasoned perfectly and the chicken is tender. The waffles are superb too. It was a great experience. Was seated with a group of 6 and everyone raved about their food. If you want to know what wine to pair with Chicken and Waffles this is the place! Service was not good! Food was very interesting and tasty. Everything was fine.Service was outstanding. I had long been a fan of Max’s Wine Dive but the changes to the menu have been disappointing and this trip may be my last. They no longer have their phenomenal truffle mac & cheese and the new recipe leaves a LOT to be desired. The waiter was a tad pushy and didn’t accept feedback or even telling them we didn’t want something. They were determined to make us want it rather than provide a different option or listen to what we did want. 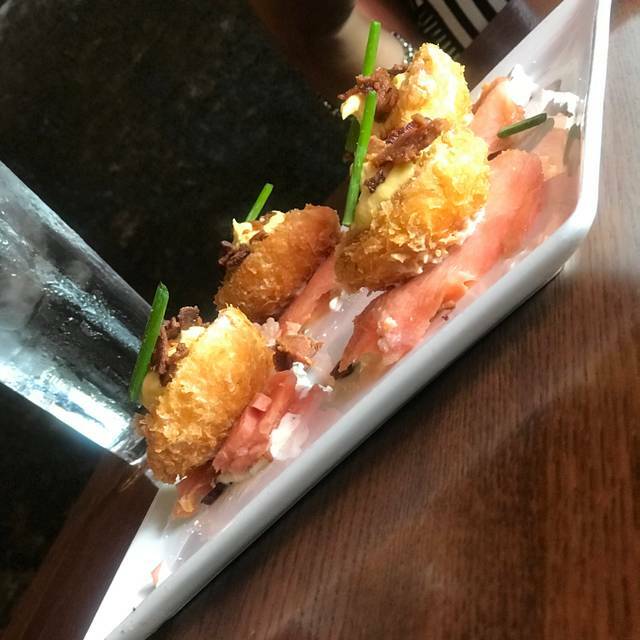 After being pressured into the “special” appetizer, when the bill came it was obvious why we were never given a price for it even when asked. I left completely dissatisfied with everything I ate and regretting the restaurant selection. I kept trying to stay in love with MAX’s but fear we’ve come to the ends of the road. 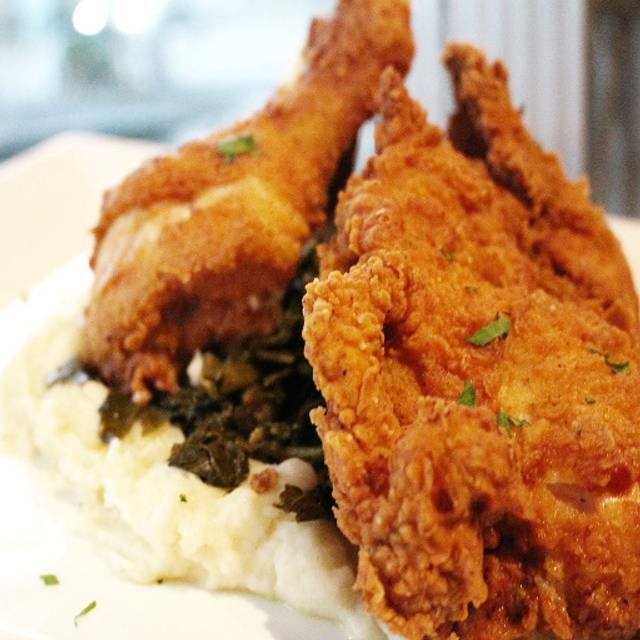 Champagne & fried chicken - a combo to savor! Never disappointing and always satisfying! Christopher, our server, was ABSOLUTELY AMAZING! His recommendation of the Shrimp and Grits and the Ghost Tequila Mimosa was superb! Brunch on a Friday couldn’t have been better! Totally enjoyed. Service was great, menu good and ambiance just right. This was my second time there and enjoyed it more the second time then the first !!! After being seated we had 3 menus that didn’t have a menu inside. Didn’t get waited on for 20-30 minutes and food took over an hour to come out. Sat on time for reservation, actually chose the bar vs floor seating as it was only two of us. Bartender was lackadaisical about getting our drink order to us. The Mac and cheese appetizer took 30 mins. Dinner (meatloaf and shrimp) took 45 mins. My date saw one part of the dinner order at the kitchen counter and asked for that before it got cold. The second part of our dinner order followed about 5 mins later. Food good, service not so much. Very slow in all areas. Not overly crowed so no excuse for waiting exactly 1 hour for your meal to be served. Portion of the meal was cold . Not sure how that happens. Party of five - one member’s order forgotten by the kitchen until we pointed out to the waiter that it was missing. Waiter hadn’t noticed only four out of five of us got a meal. In addition, the two teenagers in our party ordered the chicken and I think the waiter should’ve pointed out to them that each order would feed two or more so we ended up with huge amounts of leftovers. Finally, it didn’t help that some lowlife wandered through their parking lot while we were inside and broke out one of our car windows in hopes of stealing something. Went with the family on Christmas Eve - food, drinks, and service were excellent. Food was a little slow coming out but worth the wait! First time here (have wanted to come but just hadn’t been able to). It didn’t disappoint. The chicken and champagne was great. Chicken came out fresh and hot and was close to some of the best I have had. The mac n cheese came out hot but the cheese seemed broken, was grainy, but still great flavors. 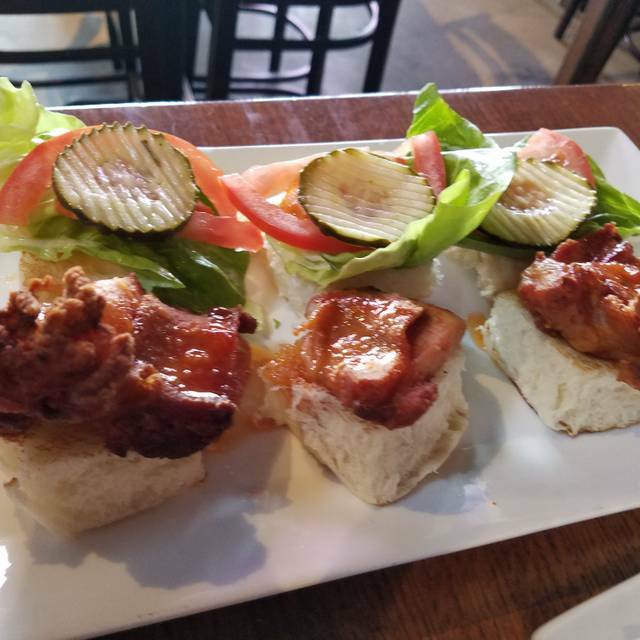 Sliders were very good too. Will be back to try more items. Our server Cory was great. Love MAX’s! My friends came to visit from home (California). 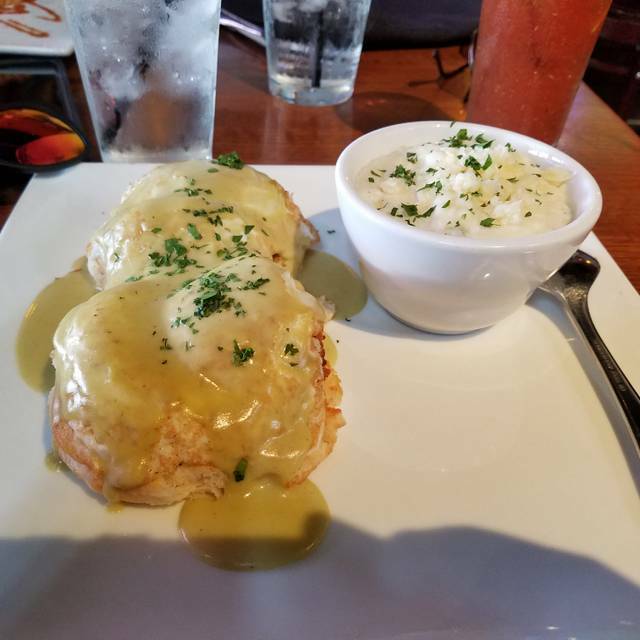 I took them to MAX’s and they had the shrimp and grits, in which, they wanted to come back the very next day to have the same dish again! 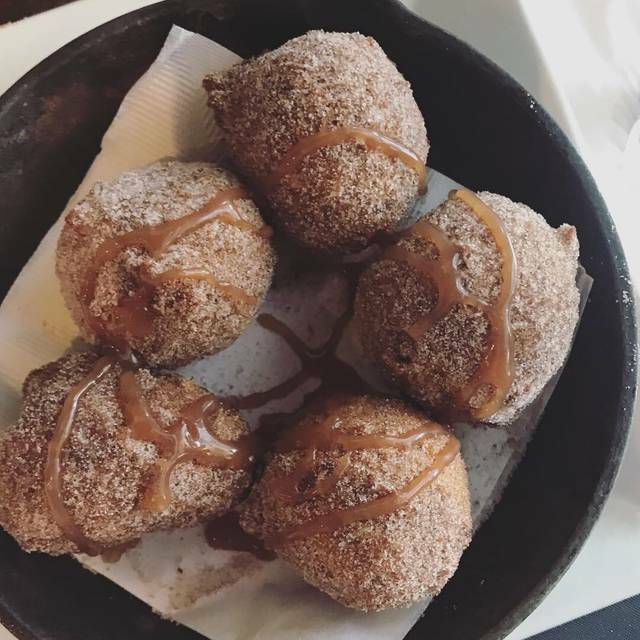 I originally took them there to try the sweet potatoe doughnut holes but they took them off the brunch menu. My feelings were hurt. The food is good though! There was some kind of problem with the computer reservation system, and apparently there was a shortage of servers and kitchen help. Neither service nor food was up to the usual standards for this place, which we visit a lot. Food was great as always. Sat outside and that definitely effected service. Took about 25 minutes to get a mimosa at 1:45, so not really a rush. Had to ask for coffee twice before it was received. Awesome place, love the chicken!! It was a quiet night when we went. Service is awesome, knowledgeable wait staff. Only complaint was the lighting, specifically the LED’s for the large posters across the side wall. It strobed very slowly, inconsistently throughout the night. It was annoying! I told the waiter, he said he would pass it along to management. I’ll be back! Love the food and wine choices!! Gluten free fried chicken was amazing and the brussel sprouts did not disappoint either! Tweets by MAX's Wine Dive Houston - Fairview St.
See Full Restaurant ListMake a Reservation at MAX's Wine Dive Houston - Fairview St.